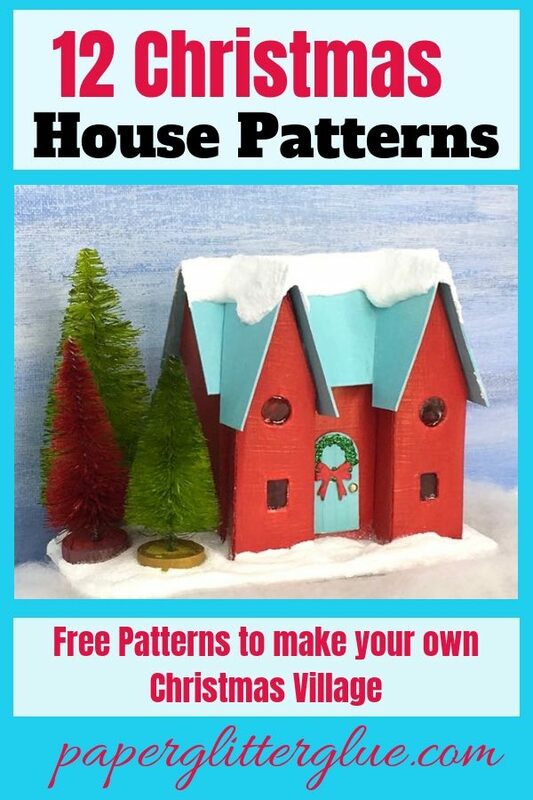 The Happy Holiday House is the 8th house in the 12 Houses for Christmas series of free patterns and tutorials to make a Christmas village. 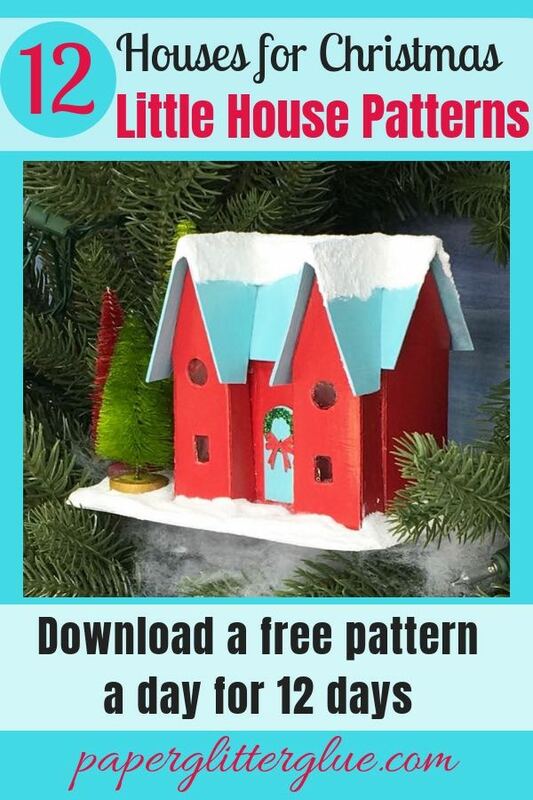 Learn how to make this Happy Holiday House – a little cardboard house – for your Christmas village with the easy and free pattern I’ve made for you. 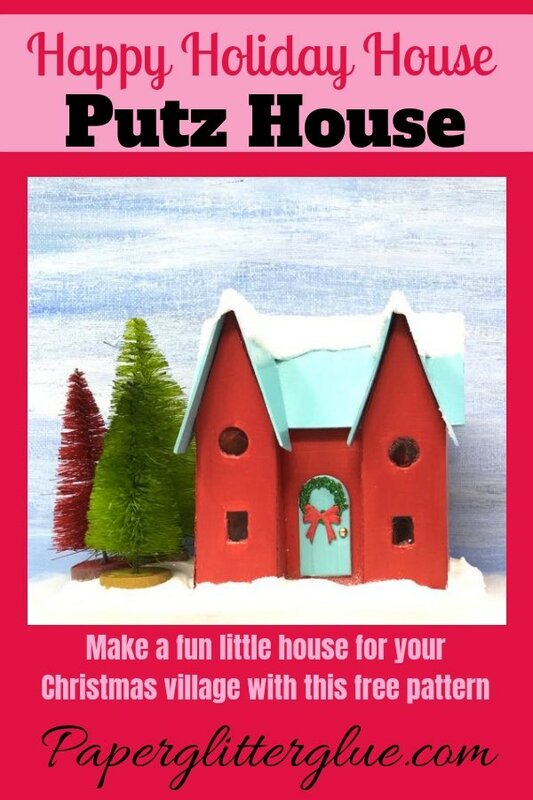 Today I’ll show you how with the Putz house pattern and instructions below. 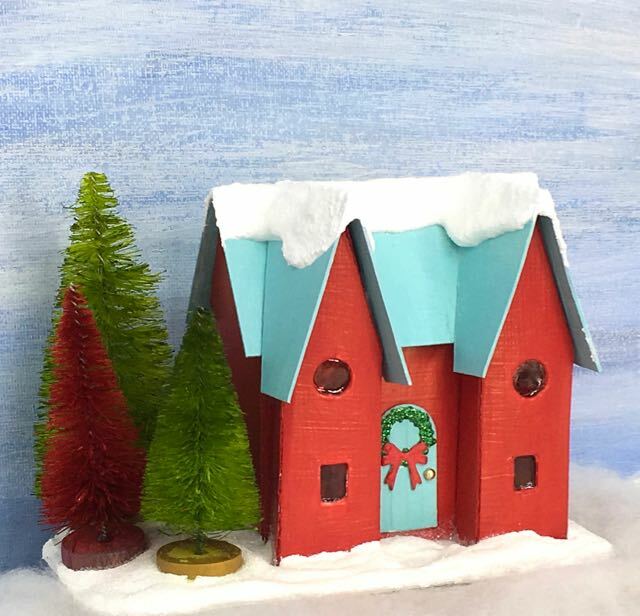 What do you need to make this little house? 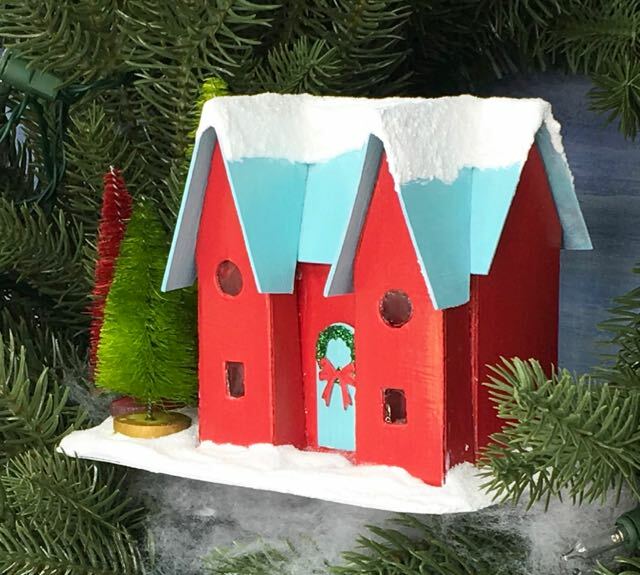 And you do you make this little Christmas Putz House? Then layer the pattern over tracing paper facing downward onto cardboard. I tape them all together and trace the pattern onto the cardboard. 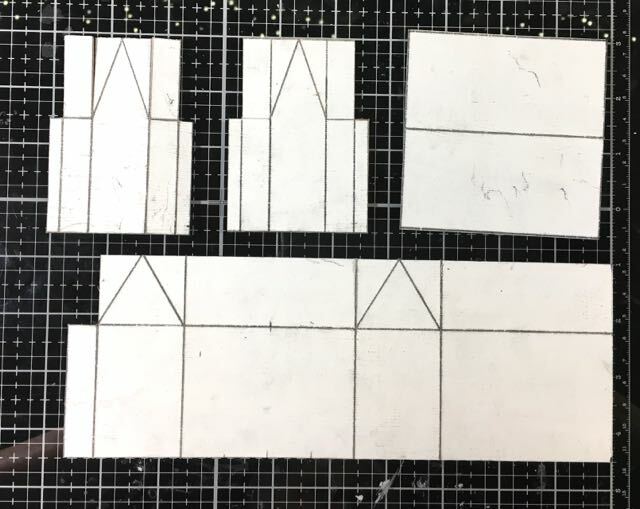 Now here are the pieces cut out. I wasn’t sure about how the front extension pieces would fit on the house so I didn’t add the cutouts on the roof until I could test fit them below. Your final pattern has the cutouts in the correct place. 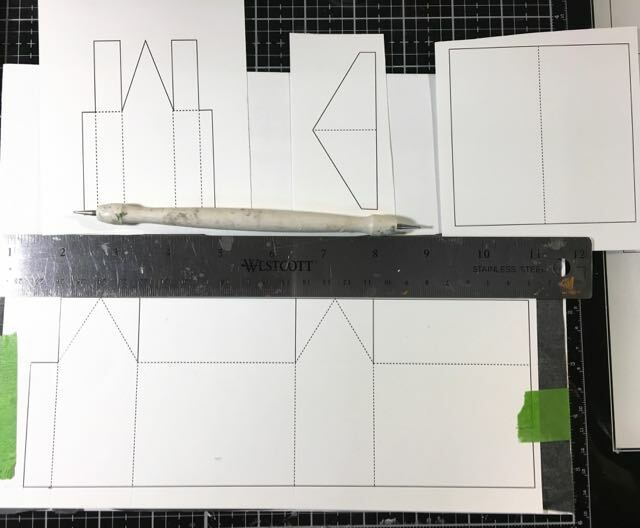 Here’s where I test fit the extensions to the house to plan the cut outs on the roof piece. The house is not glued together at this point. Binder clips let me to the test fit before gluing. Now with the cut outs on the roof I can see that the house will go together properly. Test fit the roof piece around the front extensions to your little house. It works. 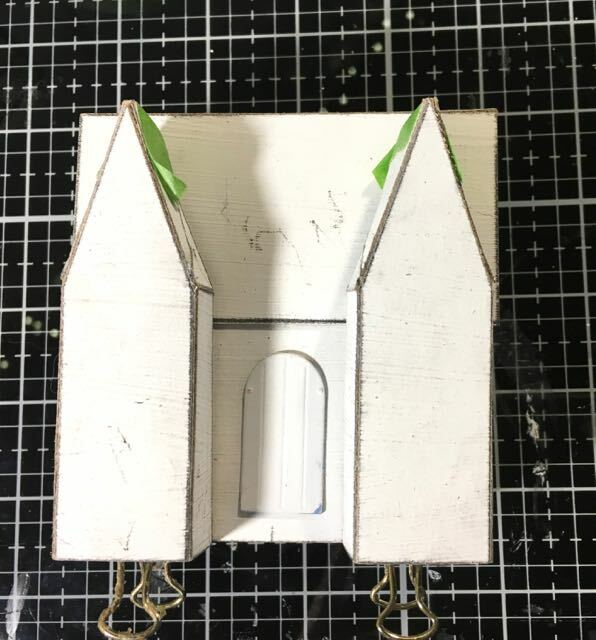 After the testing that all the parts fit, I cut out the windows on the front pieces and the house itself. For this house I didn’t cut out the door. This is the stage where I usually prime and paint the house. You can wait until the house is all assembled, but then I get paint in the wrong spots. So I usually paint the roof and the house before they are glued together. You might be a much better painter than I am. More binder clips to the rescue in the photo below. Often I use this type of binder clip to hold pieces together in tight spaces. They work really well gluing down the roof tabs onto the roof flaps. Also you can see where I glued some red acetate windows (scrounged from clear packaging stained with red alcohol ink) to the back of the windows. It gives a nice red glow when I light is inside. If you are adding a door to a cut out section, I would add it now. If not you can add it during the decoration phase. Another important feature in this photo is the window cut out on the house itself. If you want light to be able to shine through the windows on the front you have to cut out a window on the house. You can make it bigger than this but I figured this was enough for these little windows. Because these houses are so small I’m not really worrying about lighting. The house is held with binder clips under the glue is dry. Back of the front extension showing the window acetate stained with red alcohol ink. Glue your house together with PVA glue. Use binder clips and/or painter’s tape to help hold it in place while it dries. Then glue the front extensions to your house. Locate them to each side of the house. After you glue the front extensions onto the house, glue the roof on fitting it around the angled gables. Then glue the roof pieces to the front extensions. I made the angled roof pattern for the front extensions a little long so you can trim them to the length you want. The cardboard base is just two pieces of cardboard glued together and cut a little larger than the house itself. 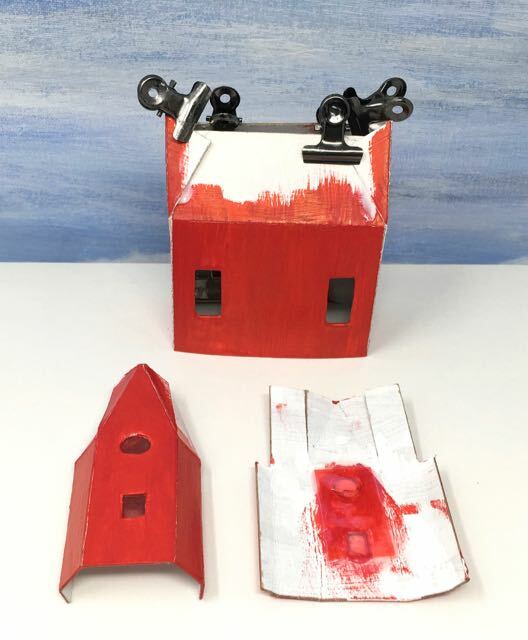 For most of the bases for this series of little houses, they are painted white. 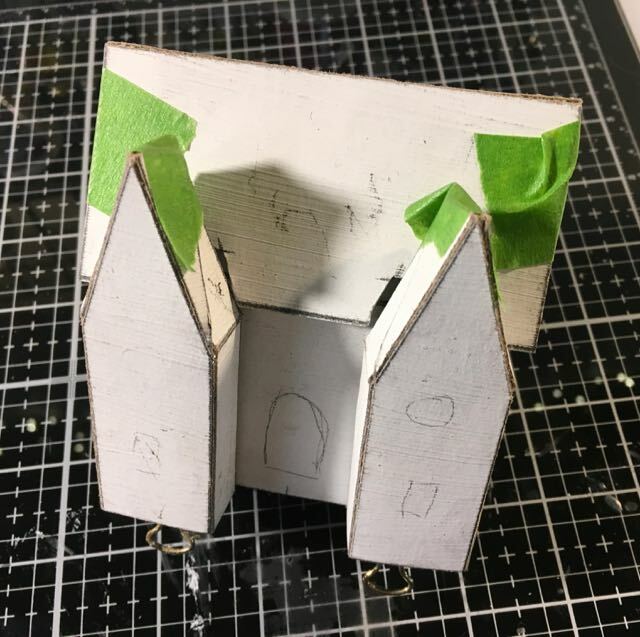 To make sure the house adheres well to the base, I run a little line of glue around the inside of the house and hold firmly to the base. Just hold it for a few minutes, then set it down and gravity will do the rest. Once the house is complete it’s time for decorating. The red is a little overwhelming so I added a light colored door and a wreath on the door. 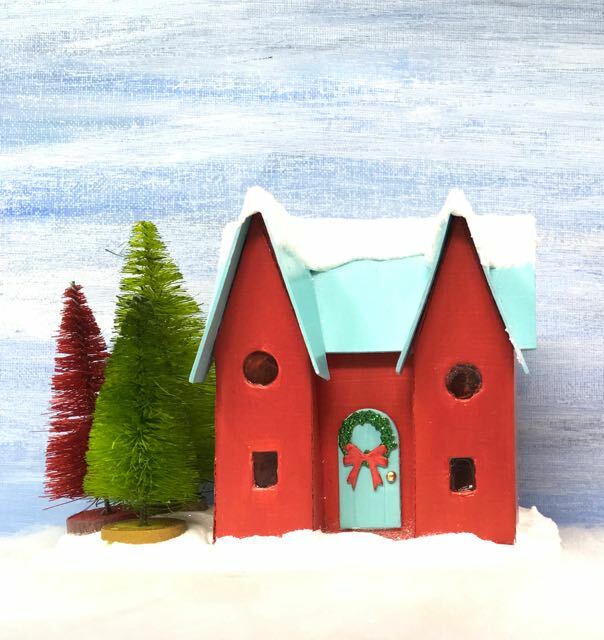 I also added a forest to the left of the house and lots of glittered snow on ground. For some reason I can’t seem to get the glitter to show up in the photos, but it looks really good in person. The next house on the drawing board is a Swiss Chalet. I think you will enjoy making this house, too. Thank you for reading. And if you have questions, just let me know. I am always glad to help. P.S. 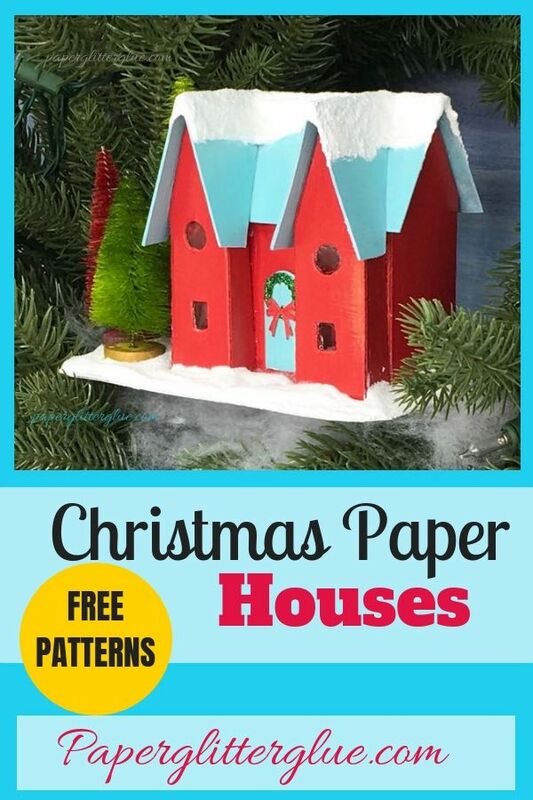 Pin any of the photos to your favorite Pinterest board to remember where you found these instructions.